Cavallotec and Ceecoach to The Rescue! Running a small business can be a challenge at times. Sometimes things go wrong and you're unable to deliver what you promised for reasons beyond your control. We were faced with this challenge at the beginning of the year when we were unable to deliver prizes to our annual league winners. Last week we met up with Nikki from Cavallotec and we think it's the start of a beautiful friendship! 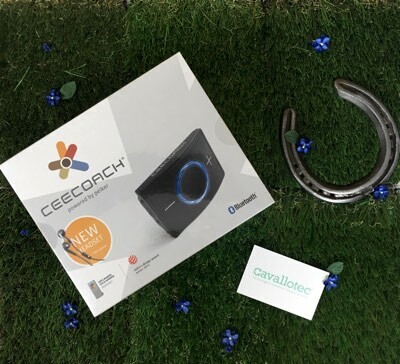 Nikki has teamed up with Ceecoach and very kindly offered us a Ceecoach communications system for the winner of our 2017 Rider League, Monica in Finland! Yet again the generosity of another small business has left us very humble and grateful and we'll be finding a way to return the favour. Nikki started Cavallotec a year ago combining her passion of IT and all things horses, to maximise the competitive performance of both rider and horse. Nikki's products at Cavallotec are really exciting. All tried and tested, they include the Ceecoach communications system which we know first hand is a brilliant bit of kit for riders and their coaches. The PIXIO auto-follow robot camera which can be used indoors and outdoors and we've had a fab demo of this. Then there's the Vert, a horse-head angle sensor and display which helps the rider to develop their feel of the horse's head carriage. And there's more products coming, which we can't say anything about just yet, but are equally as exciting. Cavallotec are offering Dressage Anywhere members an exclusive 10% discount off all products bought outright and you'll find all the details on our Gift Guide page.